The stone facade of this building has very clean lines and creates the appearance of light radiating from the doorway. 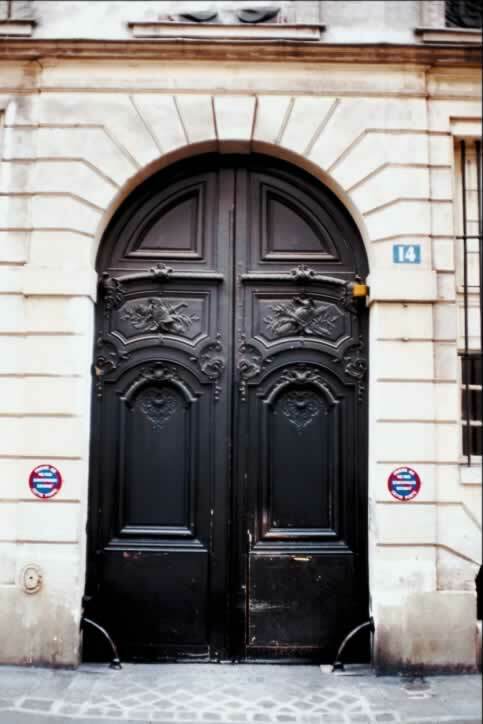 Together, these double doors form a rounded (or true) arch. Each door is framed with three panels and an especially high bottom rail. The top panel of each door is a quarter of a circle, or a wedge. Each wedge is trimmed in molding. The second and third panels are ornately carved. The second panel is railed and both doors have matching carvings. The third panel is arched, echoing the arch that the doors form together. Inside the arch, at the top of the panel are more, ornate carved details. The bottom rails and bottom panels show evidence of wear and damage. The molding at the bottom of the top panels and the molding on the rail below also show wear. There is no visible hardware on either door.